This is the 1901 Census for the Parish of Wimpole in Cambridgeshire. 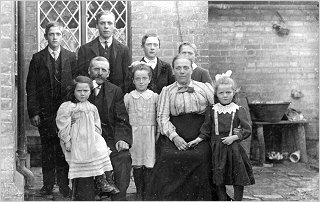 There were 240 men, women and children living in the Parish of Wimpole on the 31 March 1901. Of those 121 are male and 119 are female. Only 114 (48%) were born in the parish and 24 (10%) gave their county of birth as Cornwall. The sudden appearance of the Cornish tenant farmers and their families since the previous census is quite marked and I assume this is because of the Robartes family, owners of Wimpole Hall, and their links with the family estate in Lanhydrock. Unlike the 1881 and 1891 census, the 1901 starts with the high moral ground (the Rectory), sidesteps to the landed gentry at Wimpole Hall (not that the landed gentry are at home) then works its way through the outlying farms and lodges down to the village of New Wimpole and hamlet of Arrington Bridge. There is a national Census every ten years when the year ends in a one. The following table gives the population of the Parish of Wimpole from 1801 to 1951 (the numbers include children and visitors from outside the parish in temporary residence within Wimpole on the night of the census). The 1841 Census had a note recording "several large families have left the parish and others have emigrated since 1831". Parish Boundary Change - Until 1999, the north side of Cambridge Road was known as New Wimpole and was within the Parish of Wimpole. The south side of Cambridge Road was in the Parish of Orwell (and sometimes referred to as 'New Orwell'). You can access the 1901 census information about the 'New Orwell' properties now located in Wimpole here. (2004) My thanks and acknowedgements to the origimal 'census team' who provided the documentation and who typed and checked the various page transcripts. Particular thanks to Mike Giddings, Susan Giddings, Alexandra Morton and John Parkins for all their help, assistance and encouragement. This transcription from the original handwriting is by Steve Odell. 2. Relation to Head of Household. 3. Married, Widowed or Single. (1) William Edmund Carter died 1940 aged 84 and was buried with Elizabeth in Wimpole Churchyard. (2) Elizabeth Carter died 1911, aged 54, and was buried in Wimpole Churchyard. (3) William and Elizabeth were parents to Sidney, Lily, Alice, Annie, Nellie, Daisy, Beaty and Dorothy. (4) There's another William and Elizabeth Carter living at Schedule 44 below. Probably William's father but I will check the family when I get down there. If the Census Enumerators 'did' schools, which of course they don't, then this is roughly where Wimpole Church of England School would appear in the census. 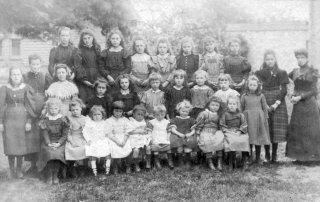 The images below are both c1900, which means (depending on the exact year) most of the pupils seen here will be listed in the 1901 Census at more or less the 'age' they are in the photographs. Boys on the left, girls on the right. 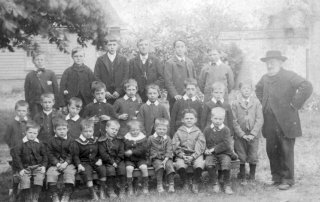 Click/tap on the photographs for larger images and some suggested pupil names. (2) See image and notes above. 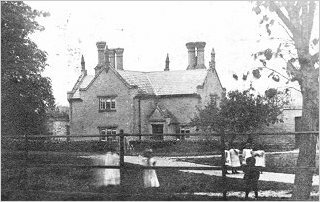 Pupils playing in the school grounds with School House in the background. 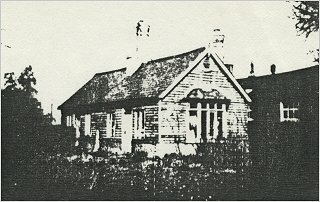 The Old School House (or 'Wooden School') Schedule 30, is off to the left of this photograph (see image above). (1) 'School House' was the residence of the village Schoolmaster. (2) Samual Horsfield was the Schoolmaster at Wimpole's Church of England School for over 40 years. (3) Horsfield was also spelt Horsefield in some local records. (4) See School Photographs for school images. 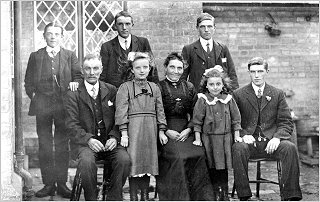 (5) In the 1881 Census the household was Samuel 48 with wife Eunice 48, and Emily 22 (School Mistress), Harry 17, Walter 14 (Pupil Teacher), Frank 12 and Maude 8. The seven Estate Worker's cottages built by Lord Hardwicke c1840 follow here (shown in the graphic below with both the original [white background] and modern-day [bold with grey background] house numbers), located along the northern side of the Cambridge Road. There were originally 26 dwellings, later reduced to seventeen dwellings - four 'doubles' and three 'triples' (plan not to scale). The numbers with an asterisk indicate dwellings [known or assumed] to be at the rear of the property. The table above initially uses fixed information from the Prospectus for the 1933 Estate Sale and from the 1911 and 1901 National Census. Yellow highlighting indicates a confirmed numbered residence (a census says 'who' but not always 'where'). I have then tried to match dwellings to the earlier 1891 and 1871 Census. Although the 1933 Sale and 1911, 1901 and 1891 Censusus above work through exactly as expected across the 17 dwellings above, it appears that the three 'triples' were originally numbered as six individual cottages and presumably built to house six families (three upstairs and three downstairs). The conversion into three larger paired dwellings (I assume the ground floor was paired with the first floor immediately above) was probably carried out during the 1880s. Cottages and named residents shown in the 1871 and 1891 censuses appears to confirm this. So for 1871 and 1891, I have tried to use the original cottage numbering system used - No 1 Cottage to No 24 Cottage right to left. I believe this is the numbering 'as built'. Note the more recent 'double' cottage on the far left is listed in both censuses as "un-numbered". Although the 1891 residents fall into place neatly enough, I think the numbering sequence confused the census enumerator in both 1891 and 1871 years and the given cottage numbers were not necessarily listed correctly against the families in residence. (1) Samuel Clarke, son of William, married Emily Rule, daughter of John (baptism says 'James'), Wimpole 1863. 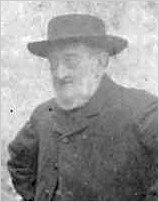 (2) Samuel Clarke died 1907 aged 67. (3) Emma Clarke baptised as Emily, died 1913 aged 73. (4) Emma Rule was mother to Charles John Clark Rule the year before her marriage to Samuel. Samuel was probably the father. See New Orwell Census (Part 3) Schedule 138. (5) The 1871 census has Samuel Clarke and family in No 1 Cottage, Wimpole eight years after their marriage as (sub?) "tenants" of John Rule who was described as Head. (1) Andrew Gadd (d 1938) and Emma Gadd (d 1959) are buried together in Wimpole Churchyard. (2) Andrew Gadd has been identified in a photograph. (1) David Pratt (b 1838) married Mary Ann Rule (1839-1932) on the 22 January 1858 and they had seven children, the first of whom was Charles Pratt (b 1860) - see schedule 45 below. (2) Despite some quite extensive searching, it took several years to establish where Mary Ann died or where she is buried. Thanks to John and Carolyn Parkins we now know she died of capillary bronchitis on the 18 March 1932 at 28 Castle Street, Farnham in Surrey where she was living with her son David. Her death certificate confirms 'widow of David Pratt, gardener domestic'. (3) Previous Heads: 1881 David Pratt, 1891 David Pratt. (1) William Bullen died 1909 aged 81 years. 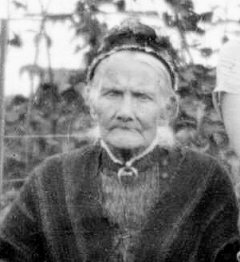 (2) Ann Bullen died 1906 aged 76 years. (1) David Spacksman of Longstowe, son of Jeremiah and Phoebe, married Elizabeth (baptised 'Betsy' otp 1821) Goates, daughter of James and Anne in 1845. (2) David died 1898 aged 77 years. (3) Elizabeth died in 1909 aged 88 years. (4) 1891 census notes David as "retired pensioner from charity at Oxford". (5) Surname spelt both Spaxman and Spacksman in official records. Six of the Estate Cottages on the left. Each cottage has either two or three dwellings. is the silhouette of Wimpole School. From an original postcard postmarked Arrington, and dated November 1 1905. The image may be earlier. Image loaned by Brenda and Michael Skinner (2014). (1) James Rule married Elizabeth Collin in Arrington in 1868. 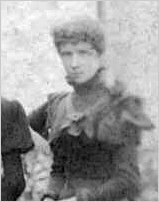 (1) Previous Heads: 1881 Elizabeth Mulberry (Jonathan's Mother), 1891 Elizabeth Mulberry. (1) In 1891, Charles and Emma Bullen were living in the Old Wooden School cottage. Emma's place of birth that census was given as Croydon, Cambridgeshire. In 1881 it appears that 17-year-old Charles was living at the Sawmill (Woodyard) with parents George and Elizabeth, although his place of birth there is given as Stretham, Cambridgeshire. (1) The 1881 and 1891 census give William Carter's place of birth as Croydon, Cambridgeshire. 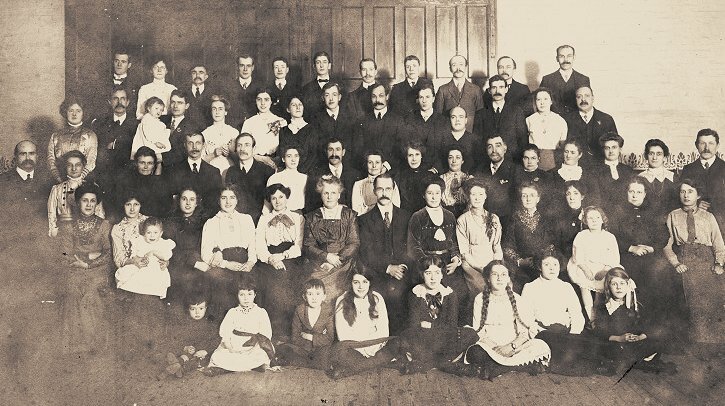 The Pratt Family, believed to have been photographed in the garden of (now) 62 Cambridge Road in the summer of 1909. Click/tap the photograph or here for a larger image with names. (1) Charles (d 1929) and Martha Pratt (d 1934) are buried in Wimpole Churchyard. (2) Charles Pratt is identified in a photograph. (3) Charles Hales Pratt is commemorated on the Wimpole and Arrington War Memorial. (1) John (d 1925) and Annie Bullen (d 1931) are buried in Wimpole Churchyard. (2) John Bullen is identified in a photograph as a Senior Estate Carpenter (holding a saw). (3) Andrew Bullen is identified in a photograph as an Estate Carpenter (holding a box plane). The Wayman Family, photographed at the back of their home at (now) 68 Cambridge Road around 1912. Click/tap the photograph or here for a larger image with names. 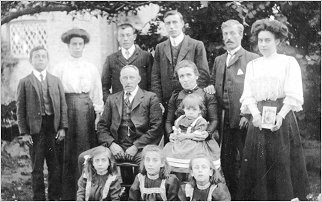 The photograph shows Walter and Annie with their seven children. Back row, second from left, is William Wayman who died four years later on the first day of the Battle of the Somme (Saturday 1st July 1916). (1) Elizabeth Annie Hurst, born 1872, daughter of Robert and Caroline, grew up in this house. (2) Robert Hurst is Elizabeth's father and the previous named tenant of this property. (3) Walter Wayman and Elizabeth Annie Hurst married at Wimpole in 1895. (4) Walter Wayman (d 1958) and Elizabeth Annie Wayman (d 1949) are buried in Wimpole Churchyard. (5) William Wayman is commemorated on the Wimpole and Arrington War Memorial. (1) Charles Skinner is identified in a photograph. (2) Charles (d 1926), Ellen (d 1940) and Arthur John Skinner (d 1977) are buried in Wimpole Churchyard. (3) Edward, Frank and Harry Skinner are buried in France and commemorated on the Wimpole & Arrington War Memorial. (1) John (d 1913), Anne (d 1908) and Reginald Russell (d 1946] are buried in Wimpole Churchyard. (1) James (d 1910), and Ann Skinner (d 1908) are buried in Wimpole Churchyard. (1) Julia Rumbold (d 1927) is buried in Wimpole Churchyard. 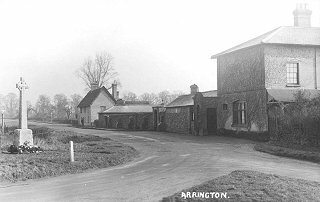 The old road junction at Arrington Bridge between the Great North Road (A1198) and the road leading to Wimpole and Cambridge (A603). On the right is the Agent's House ("Wimpole Lodge" - Schedule 61 below) and the white thatched cottage beyond is No 38 (Schedule 58 above). The newly erected Arrington and Wimpole War Memorial is on the left. The junction was closed in 1991, following construction of a new roundabout 200m to the north. (a) John Tooker Weary (d 1916) and wife Elizabeth Weary (d 1933) are buried in Wimpole Churchyard. (b) See also Schedule 8 above for (son?) Frederick G Weary. The 1901 Census for Wimpole ends here.